The Department of Mines and Petroleum is pleased to invite you to its annual Women in Mining event on Friday 6 May 2016. The theme for this year’s event is ‘Building community confidence in the environmental management of the resources sector’. In today’s business world community confidence can make or break a project. It can stop a project in its tracks, or even before it has started. That is why community perceptions of the environmental performance of the industry is critical to safe, sustainable resources development in Western Australia. DMP believes government- including ourselves as the regulator – and industry play a critical role in building confidence within the community that the State’s environment is sustainably managed. 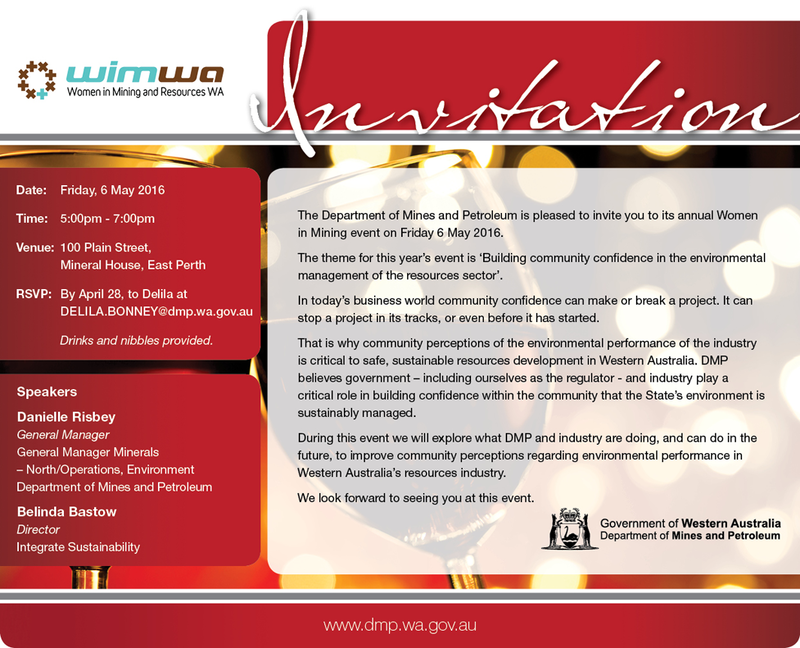 During this event we will explore what DMP and industry are doing, and can do in the future, to improve community perceptions regarding environmental performance in Western Australia’s resources industry. 5:00PM to 7:00PM - Drinks and nibbles provided.